Posted on November 14, 2016 by Barry V.
I fork off from the Try Island TraiI, and follow the boardwalk out to the beach. 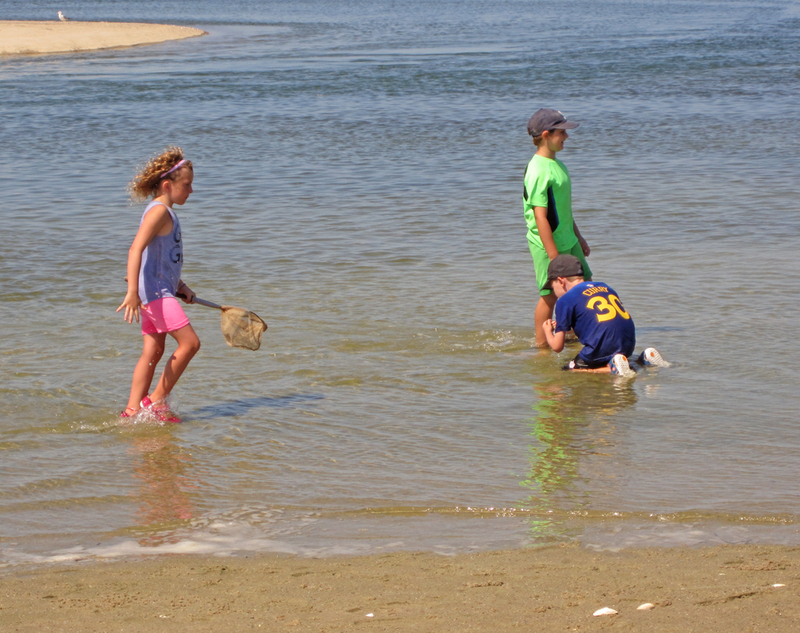 A group of kids are busily exploring the shallows, sweeping the water with dip nets and whooping with delight! On my way back over the boardwalk, I pause to watch the fiddler crabs. These are mud fiddlers, Uca pugnax. 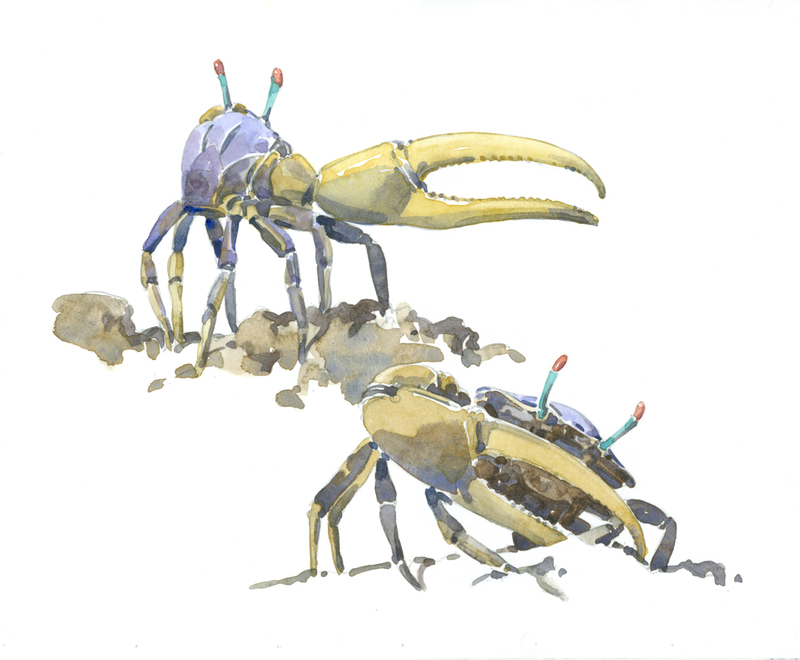 The males, with those impossibly large and dangerous looking pincers, pop in and out of their holes in the mud, or scuttle after intruders. It occurs to me that the abundance of crabs is the reason for the presence of so many laughing gulls on the marsh. Their wheeling and pouncing dives must be attempts to capture the elusive crabs. The Goose Pond Trail passes through a coastal heath restoration area. 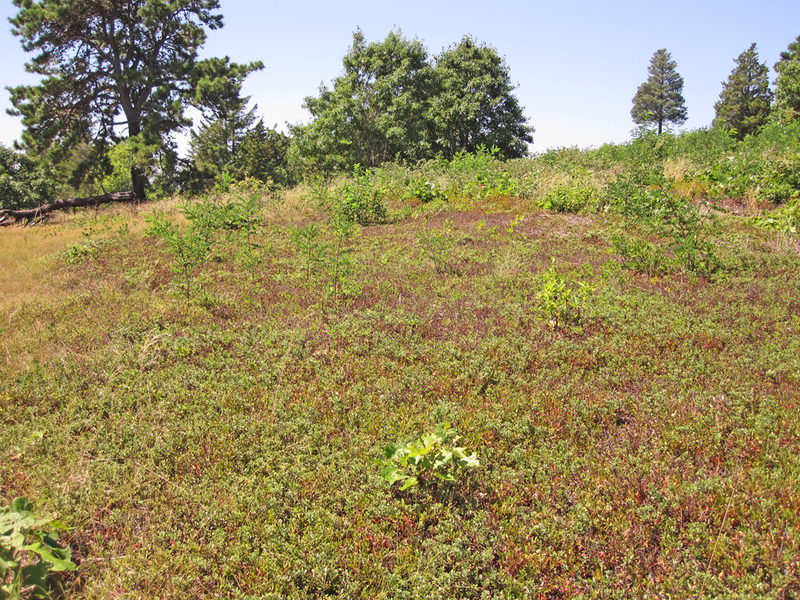 Mass Audubon is working to restore and protect this rare natural community, consisting of low shrubs and a thick ground cover of bearberry. I’ll have more to say about coastal heaths when I visit Sesachacha Heathlands Wildlife Sanctuary on Nantucket, which I plan to do in November. By early afternoon the day is hot, and Goose Pond is quieter as I make my way back to the visitor center. I meet an enthusiastic young naturalist, and we bird together for a while. 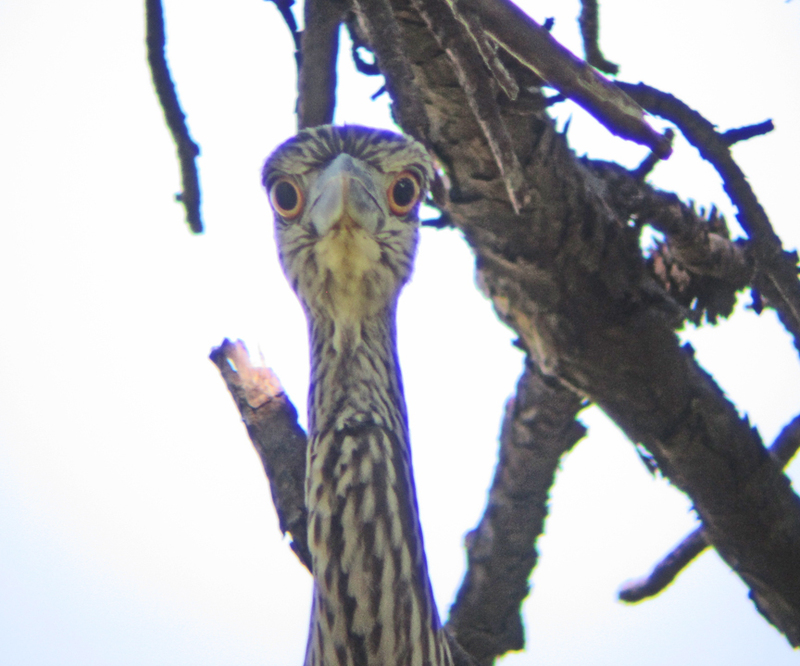 I show him the stilt sandpiper (which is still present), and he spots a yellow-crowned night heron perched in a big pitch pine, which we scope from several vantages along the trail. 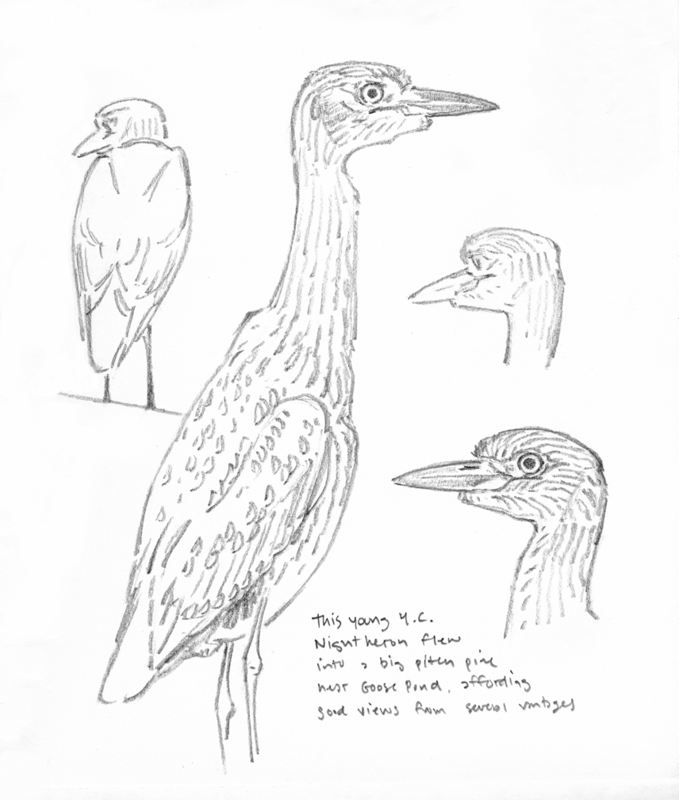 In my sketchbook, I work to capture the preposterous facial expression of this bird, which from head-on looks downright WEIRD! 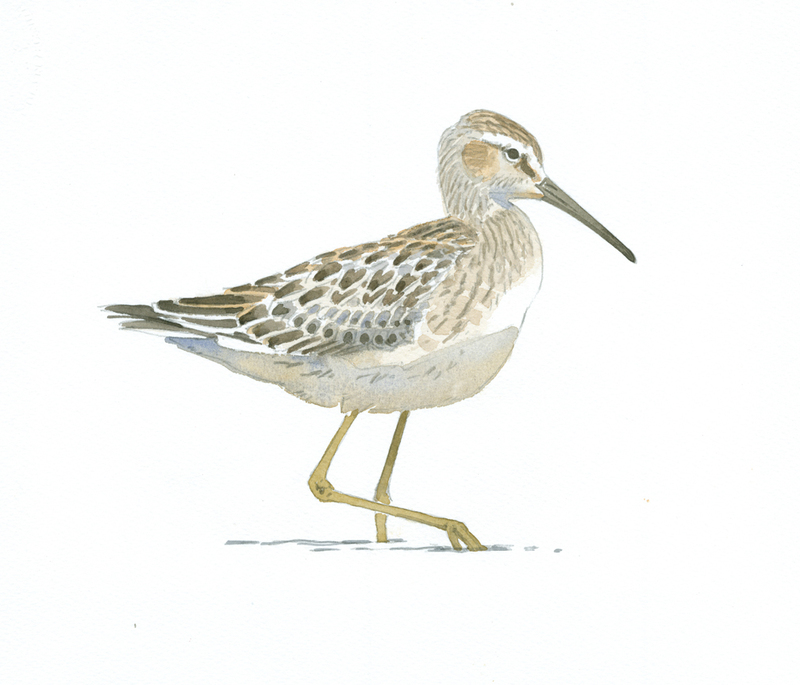 This entry was posted in Artists, Barry Van Dusen Residency, News and tagged Beach, Goose pond, Kids, Mud fiddler crabs, South Wellfleet, Stilt Sandpiper, Uca pugnax, Wellfleet, Wellfleet Bay Wildlife Sanctuary, Yellow-crowned night heron on November 14, 2016 by Barry V..